Bertie Wooster is a lovable, wealthy young man who is totally delusional. He wouldn't be able to solve any problem if he didn't have his imaginary friend to help him out in form of Jeeves, a factotum. Basically, Jeeves is like SIRI before there were cell phones. Whenever Bertie or one of his friends is in trouble, they ask "Jeeves," who appears out of nowhere in front of Bertie and tells him and his friend how to solve their problem. Okay, so maybe Bertie isn't delusional. OR IS HE? You don't know. 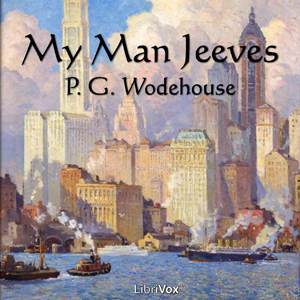 My Man Jeeves is a collection of short stories in which Bertie runs into a lot of mishaps, mostly involving women, and the djinni-esque Jeeves suggests ways for him to get out it, mostly involving lying. Over half of the stories, however, have a fellow (I have adopted the nomenclature) named Reggie as the protagonist. I'm guessing this is Jeeves before he became Jeeves--otherwise, why have the stories in a book titled My Man Jeeves? These were actually more interesting than Bertie's stories, because Reggie REALLY gets himself into some scrapes. These stories were soooo much fun. I listened to the audiobook from Librivox (read by Mark Nelson, who did a really excellent job) and giggle-snorted through every single one--which is not comfortable when you're trying to hold a yoga position, fyi. I classify these stories as coming-of-age because nearly every one involves a member of the older generation--dad, aunt, etc.--standing between a younger person and what they want. In one, a poet wants to hang out in the country and watch bugs all day, but his aunt threatens to cut him out of her will unless he lives in NYC and tells her about the all parties he goes to. In another, a young artist feels stifled by the presence of his father's masterpiece in his house, so his wife arranges to have it stolen. Mainly these situations are played for comedic effect, but there's a definite sense that the characters are only just beginning to figure out who they are and what they want. If you haven't read these stories yet, you should. They are super-funny and -entertaining. And as a bonus, suddenly everything on the internet makes sense.